EaseUS MobiSaver For Android 5.0 Review: Does it work well? CHOETECH T520 QI Fast Wireless Charger Review: How Well It Charge? How to Unlock Bootloader on Xiaomi Mi A2 / Mi A2 Lite? Google announced Allo apps which are amazing instant messaging app released by any company so far, but there are already many famous chat apps like Facebook Messenger, WhatsApp, iMassage and IMO and they are tough competition for Google Allo. I’ve used Google Allo and I found out that it is a really amazing app and it will answer all your questions smartly (hopefully) whether they are related to Chemistry, Technology, Physics or even arts. Here are few Google Allo Tips and Tricks that you can use to improve your experience with the app. Select Start incognito chat option. Now tap the contact name from the list of people you want to start a chat with. When enabled, the chat content won’t show in the Allow conversation list. Moreover, the name of the sender or the message content will not display in the Notifications. You can even mute the notification tone for the incognito chat. Incognito mode also allows you to set an expiry time for the chat messages. It means you can choose after how much time your messages should disappear: 5 seconds, 10 seconds, 30 seconds, 1 minute, 1 hour, 1 day, 1 week, or never. You can set the message expiry timer in Incognito mode simply by tapping the Timer icon found on the top right corner of the screen. Start a chat with a contact. Then type “@google” in the text input field. After that, you can ask your Google assistant to give you any info. Tap and hold the conversation you want to delete. Tap the conversation from which you want to delete a specific message. Press and hold the message you wish to delete. A menu will appear at the top of the screen. Tap the Delete icon> Delete. Tap the contact profile icon in the upper right corner of the screen. To prevent one of your contacts or an unknown number from bothering you, you can block them easily in Allo. Tap and hold the conversation. Select Block or Turn off notification option in the menu that pops up. Tap the contact name or number on the top of the screen. Tap the Mute icon or the Block button. Type the text you want to make bigger or smaller by tapping the holding theSend button. You’ll see a vertical slider. Just drag your finger up to make the text bigger, or slide down to make it smaller. 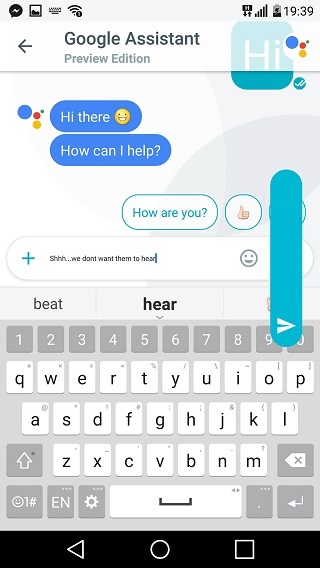 This is again another interesting feature in Allo. While WhatsApp lets you add a caption to an image, Allow allows you draw on an image and add text to the image itself. Now tap the “+” (add) icon found on the left of the text input field. Tap the Edit icon> sketch icon, select the color and then start drawing on the image. To add text to the image, tap the text icon and then you can type your text on the image. Having made the changes, tap the Send button. You can search for keywords from past messages in Google Allo. This is currently only available on Android devices. Then type your query word. You’ll see a list of results from all conversations with the query text highlighted. Tap the conversation you want to search in. Tap the profile icon in the upper right corner of the screen and then tap the Search option. Type the text you want to search. If you use WhatsApp, you must be aware that the app shows the time for each of the messages in Chats. Google Allo does not do that by default, but there’s still a way you can find out the time when a message was sent to you. Then tap a message to know when it was sent to you. Founder of 'TechWafer' Information Security Researcher, Freelancer, Blogger, Developer, and Part-Time White Hat Hacker. best part in Allo is With Google Assistant in Allo, users can be more productive while chatting. All you need to do is add Google Assistant in the chat, and ask any question to help you while having conversations such as asking for movie times and local restaurants; researching travel destination, flights, hotels and more. News, reviews and everything else that falls into the wide world of the Android mobile operating system. For any assist and query please contact us. Copyright © 2019 Upto Android, All Rights Reserved.